BITheap: FT232R BitBang mode is broken. """The current revision of the FT232R is revision B, released May 2007. At the time of releasing this Technical Note there are no known issues with this silicon revision.""" There should be no rev A on the market anymore. Rev B was released in 2007. I've has the same problem for months, and I have just stumbled on this article. Thank you because I would never have found the FTDI Errata TN_120 without you. This means I have the revision C of the device. But having looked at the Errata, it notes that Rev A has the problem but it will be fixed in rev B. If it was fixed in rev B - it's now broken in rev C !!! We sent our evidence to FTDI support and they agreed that it is a bug with the chip. 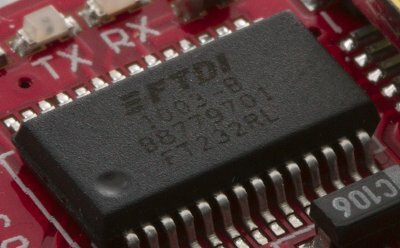 The FT230X is a similar USB-to-serial chip that also has a bit-bang mode, and it works perfectly. (@Nigel Webb: and it also comes in a dev package, UMFT230XB). I also beat my head against this for a while before discovering the same thing. For others passing by, the bit-bang mode on my chip actually seems to work ok with the baud rate set to 65536, which is fast enough for my purposes. Maybe there are other sub-3MHz rates that are also stable? libftdi does some munging of the baud rate so the rate that gets set on the chip is probably actually 65536/16 = 4096 to account for the 16x that applies in bit bang mode. In our experiments 65536 still gives timing problems. We were using it to generate infrared button-presses, resulting in ~2% of button-presses to be so far off the timings that the set-top box or TV wouldn't recognize them. With most other baud-rate settings, the chip wouldn't work at all. Like everybody I can confirm that the bug was still there as 2016/2017. One thing I noticed is that if you make your own FT232R board with an external clock, the issue goes away.